Will I need to use the products in the long term? Yes. The products work together against hair loss. The treatment lotion acts to slow and arrest hair loss. 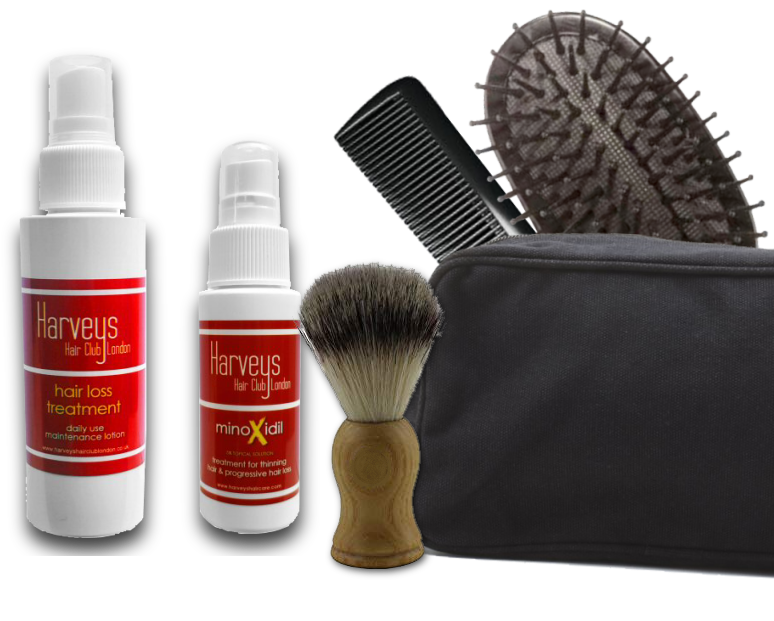 Harveys minoxidil can be used to regrow hair in bald or balding areas. The causes of hair loss are generally ongoing, which means that and hereditary and other factors will remain for life. Why do you have two different products to combat hair loss: the Anti-Hair loss lotion and Minoxidil? The Anti-hair loss lotion is aimed at individuals who are, or have been, experiencing premature hair loss. This product is not designed to regrow hair on bald or balding areas, but simply to slow or arrest the process of hair loss. It is best suited to individuals who want to achieve this without using a medicinal product such as Minoxidil. Minoxidil is designed to regrow hair on bald or balding areas where the hair has already been significantly lost. Although in the form supplied (5% solution) minoxidil is now off-prescription, it is nonetheless a medicinal product which should be used in controlled doses. Harveys minoidil 5% is equivalent to Regaine® (Rogaine®) extra strength and acts in exactly the same way. Both products can effectively be used together and further details on this are supplied in the leaflet accompanying Harveys minoxidil. Do you have to use the Anti-Hair loss lotion and/or Minoxidil every day? In order for the active components in the lotion and minoxidil to remain effective and combat the ongoing causes of hair loss, it is essential that they are used on a daily basis. Are the products also suitable for women? The anti-hair loss lotion is suitable for women. Our 5% minoxidil product is for use only by men. It is possible to obtain a 2% Minoxidil solution for women from high street retailers, but we do not have this in our product line. I have been using the products for some time but no hair has grown back. Does it not work for everyone? It is important to be clear that the anti-hair loss lotion is not meant to be a hair restorer. The primary objective is to slow and arrest hair loss. However, as a result of the improved condition of the scalp and hair and strengthening of existing hair follicles, there may be some apparent improvement in hair density or bulk. Harveys minoxidil should be used if the aim is to try to regrow hair on a bald or balding area. Minoxidil is the only topically applied product currently available which has been proven to regrow hair. It should be noted, however, that not all men will experience re-growth. Harveys minoxidil 5% is equivalent to Regaine® (Rogaine®) extra strength and acts in exactly the same way. Do the products work the same way for all men? The effectiveness of the products of course will depend on many factors which can contribute to increased and/or premature hair loss. Factors such as stress, environmental toxins, vitamin deficiencies, etc can have a negative impact on the problem. However, long-term usage and experience with these products has shown them to be very effective on a very wide range of clients subject to a variety of negative factors. Do I really have to wash my hair every day? Many men avoid washing their hair regularly when they experience premature or unusual hair loss as they think this loss is accelerated by frequent washing. The reverse is in fact true, and the hair should be washed regularly to keep the scalp clean and receptive to the action of the hair loss lotion treatments. However, it may not be necessary to wash you hair every day as the Anti-hair loss lotion and/or minoxidil are still effective when applied to a dry scalp. Much will depend on the overall condition of your scalp, especially if you suffer from dandruff. Apart from the products, can I use other products such as gel or hair spray? Yes, after using the products, wait for a short time to allow the product to be absorbed; then use your styling product. Please see the product leaflets, particularly for minoxidil, for more information on how to use other styling products in conjunction with Harveys products. Can the Anti-Hair loss lotion also be used on dry hair or is it absolutely necessary to wash the hair before application? The lotion can also be used on dry hair, without prior washing. The lotion should be applied directly to the scalp and massaged in. As the lotion is absorbed into the scalp quickly, you can then style your hair as usual. The alcohol content may cause brief tingling of the scalp, which will disappear quickly. Make sure you avoid contact with the eyes. Harveys minoxidil should be used on a dry scalp only as any wetness can inhibit absorption of the active ingredient. If a hair dryer is used to dry your hair it should be done before the application of minoxidil as use after application will tend to evaporate the product before it can properly be absorbed. Why should I use Harveys minoxidil rather than Regaine?®(Rogaine®)? Price! Regaine is a great product and is the original branded topical Minoxidil, but as with many branded medicinal products (for example, aspirin, paracetamol, etc) there is a premium to be paid for a brand name. When you buy a packet of aspirin from a high street pharmacy, you can buy the retailer's own product or pay more for a well-known brand. However, they both work exactly the same way and have exactly the same effect. The same is true of Harveys Minoxidil. It works exactly the same way as Regaine® and will produce the same results, but you don't have to pay the price premium. Harveys Minoxidil is a premium product manufactured in North America, so you can be assured of its quality.